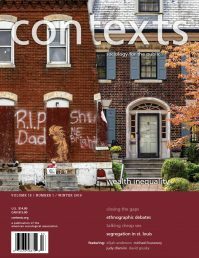 Contexts is a general interest sociology magazine. The writing is crisp, the stories are engaging, and the magazine appeals to both sociologists and educated “lay” readers such as mothers-in-law, university students, policy professionals, activists, and anyone who’s interested in insightful social analysis. We welcome contributions from social scientists, journalists, K-12 teachers, and anyone else who writes incisively and in an engaging style. We’re looking for insightful analyses. We welcome intellectual risk takers. We publish longer, feature articles (that go through a peer-review process) and shorter “department” articles selected by section editors. We welcome your feedback! Please send all letters and comments to editors@contexts.org. We are always on the lookout for images for our front and back covers, and to accompany articles, essays and commentaries. Single images will be considered, as well as pairs, trios or sequences that represent related and contrasting elements. Most photographs and illustrations are printed in black and white, except for the front cover, which is in full color. If you would like to submit an image for which you own the copyright to Contexts, please contact: editors@contexts.org.